Socionext is the market leader in high-performance packages. 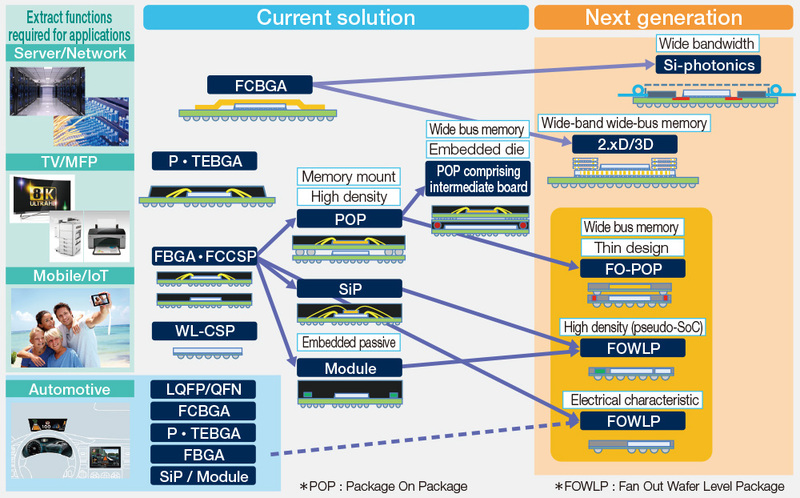 With in-house expertise in high-pin-count, flip-chip and multi-chip-module packaging technology, we offer customers differentiated package solutions. Our thermally efficient package designs are capable of high-speed signaling over a 30GHz bandwidth. Specifically, our packages feature high ball counts with more than 4,000 pins, and large packages which are over 60mm on a side. Our multi-substrate packages have up to 32 layers. For BGA packages, our unique development Metal TIM achieves super-low-theta JC, which is below 0.05 degrees and is certified by the latest thermal resistance measuring technology. We are now working on the next-generation 2.5 and 3D package technology for CPU and server applications. In developing these highly reliable packages, we do meticulous simulations and optimize prototypes.